The other Friday I took Stu for a birthday outing to something he's been wanting to go to for years: Dickens World. 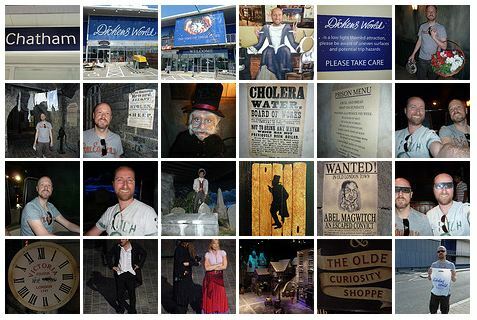 DW is a Dickensian theme park built on an industrial estate in the lovely town of Chatham - well, half an hour's walk out of Chatham to be precise - down by the old docks. Once there (on a half-priced Fagin's Earlybird Friday deal) we were treated to A Christmas Carol haunted house, an animatronic theatre show "featuring all your favourites", a "4D" cartoon film biography of the great man, Oliver Twist being acted out/mimed and an Old Curiosity Shop to buy all the tat quality mechanise we could wish for.